On Monday the 12th of September, the news cycle was inundated with reports of a video that surfaced online showing US Democratic Presidential candidate Hillary Clinton struggling to stand up while waiting to enter a security car. The video shows her being supported by her security team whilst some of the other members of her team try to keep her from view. Mrs. Clinton had just attended the 9/11 memorial in New York City and had left earlier than expected. After the video went viral, her team had no choice but to release a statement from her physician indicating that Mrs. Clinton had recently been diagnosed with pneumonia. Mr. Trump’s reaction to the announcement was not as incendiary as usual, partly because he and his team had helped fuel rumours about Mrs. Clinton’s health for a while and even more so after her coughing fit at a rally in Ohio. They had also made an explicit link between such rumours and her supposed inability to be commander in chief. He knows that this confirmation of illness will only propagate the existing rumours and help solidify in the public’s mind the link between illness and incapacity for leadership. He has been able to exploit this link even more so because Mrs. Clinton is a woman and has had to deal with extreme forms of scrutiny which he has escaped to some extent. Mr Trump himself has been surprisingly scarce in the health information he has provided to the public, although he promised this Monday he would release the results of his recent medical check. Why, then, are health issues such an important factor used to determine someone’s ability to lead a country? The interconnection between health, disability and capacity to lead has always been present. It is well known that American President Roosevelt’s impairment (he was a wheelchair user) was carefully managed and removed from the public’s eye whenever possible – this was much easier to do at the time of course. But we now know that many distinguished world leaders never shared with the public private health issues that affected them. For instance Winston Churchill’s recurrent depression, which he documents in his private diaries, famously terming it “the black dog”, was not well known at the time of his leadership, nor was JFK’s need for constant back pain relief. On the other hand, current British Prime Minister Theresa May has a long term health condition that she has often discussed openly in interviews. In sum, many world leaders experience mental distress, long term illness or impairment and this does not affect their capability to lead. However, many feel this is still something to keep away from the public’s eye. The underlying message, of course, as the current case regarding Mrs. Clinton demonstrates, is that if you are ill or disabled you would be somewhat less qualified or able to hold a leadership position. Much of this relates back to our cultural beliefs that associate illness and impairment with particular character traits. As Susan Sontag argues in her book Illness as Metaphor and AIDS and Its Metaphors, historically Western cultures have tended to read into illnesses such as cancer or AIDS particular failures of character that are supposedly revealing of the person underneath. When it comes to mental distress it is perhaps even more so. On the other hand, such discussions harbour a deep entrenched belief regarding how we see work and personal performance. The media image of world leaders is often one where they work tirelessly without sleeping much – in fact, much like trainee doctors, they often pride themselves of working without breaks and with little sleep. Often this feeds into the illusion that such people work all the time which is possibly true at times but also hides the fact that they have an army of helpers that makes a difference. Such discussions are pernicious though, because inevitably they reflect our society’s beliefs and expectations of work performance in general. These are the same underlying ideas that lead to some people being praised in institutions for arriving early and leaving late, regardless of whether they might spend most of their time browsing the internet and not actually doing any work, whereas working from home is frowned upon and still seen as undesirable. We still tend to value mostly the outward appearance of performance. Lastly, beliefs about the importance of endless stamina benefit mostly particular kinds of people who find it easier to control their bodies in public in particular ways. People who don’t have to save energy to cope with endless microagressions regarding their race or gender expression. People whose bodies can appear to be uneventful because they don’t bleed or they don’t get pregnant. People who apparently do not “need” bathroom breaks or enough breaks to eat. People who never thought about what it means to use a toilet or an office because toilets and offices are tailored to the needs of their bodies. What this discussion really does though is hide the reality of human existence: that our bodies and minds are not machines (and in fact even machines break down) and that literally every body and mind will have different needs at different times. I would challenge anyone to have high fever and pneumonia and not be weak in the knees. Mrs. Clinton’s campaign played into the hands of opponents by not being forthcoming about her health information, but the probability is that they hid it to try to contain criticism and doubt in the first place. Thus it is a damn if you do, damn if you don’t situation. This is something that many people who live with long term illnesses or impairment can probably relate to. Originally published on the Liverpool Hope website. This article is based on research about the daily lives of people living with chronic illnesses in England and Portugal. Through the first-person narratives of participants, I argue that the lives of people living with debilitating chronic illnesses are affected by disablism, discrimination and exclusion. These aspects affect them in several important realms of life such as lack of or poor social support, difficulties in obtaining reasonable adjustments or the inability to obtain any kind of state support at all. These aspects are also widespread and compound and greatly influence their lives, beyond or in addition to the physical experience of the illness itself. I conclude that it is fundamental to change these structural and policy aspects and that people should have access to what I have termed a paradigm of sustained well-being, despite the illness. I have a new book chapter included in an exciting new collection edited by Colin Cameron called Disability Studies: A Student’s Guide. The chapter presents some of the main debates and traditions in feminist disability studies. The book itself intends to present students and newcomers to the area with basic ideas and debates in disability studies. More information can be found at the Sage website. 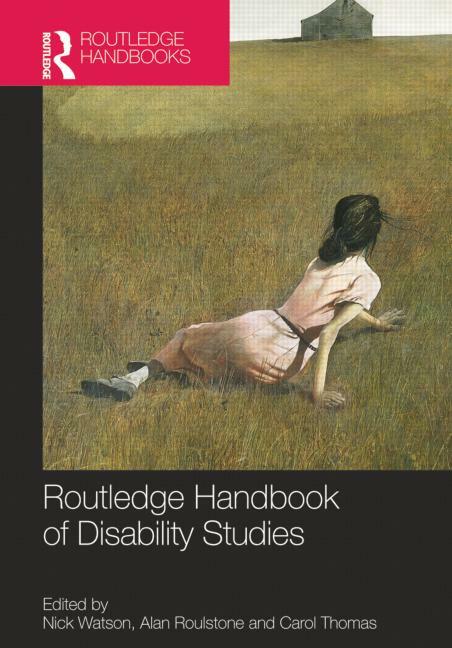 I have a book chapter included in a new exciting collection entitled Routledge Handbook of Disability Studies (edited by Nick Watson, Alan Roulstone, Carol Thomas)- this will be published early next year. The title of the chapter is “Feminism and Disability: A Cartography of Multiplicity”and it focuses on issues of gender and disability by mapping out some of the main debates and contributions brought forth by feminists in the discipline of disability studies. This particular tradition within disability studies is also sometimes refered to simply as “feminist disability studies” and it has been responsable for many important ideas that are central to disability studies. It has also provided an essential place of belonging for anyone interested in both gender and disability, since traditionally women and feminism have been marginalized by some sectors of disability studies while disability remains largely ignored by mainstream feminisms. More information on the book is available here. A draft version of my chapter is available here.